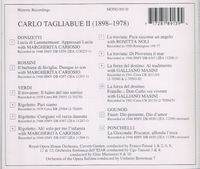 “Carlo Tagliabue’s début was 1921 in Lodi as Amonasro. After several appearances in various theatres he came to La Scala in 1929 at Toscanini’s behest. He appeared in 39 different rôles at La Scala alone. His conductors were de Sabata, Serafin, Guarnieri, Votto, Marinuzzi and Karl Böhm (who admired him as Wolfram). Further stations of his career were the Arena di Verona, Rio de Janeiro, San Paolo, Lisbon, Wiesbaden and Vienna. In 1936 he sang at Covent Garden in a Gala performance on the occasion of the coronation of George VI. For two seasons he appeared at the Met as Rigoletto, Amonasro and Marcello. His home remained La Scala, he belonged to its ensemble for more than 30 years until his farewell in a performance of LA TRAVIATA with Maria Callas and Gianni Raimondi in 1958.